I have been dying to have another go at doughnut making. 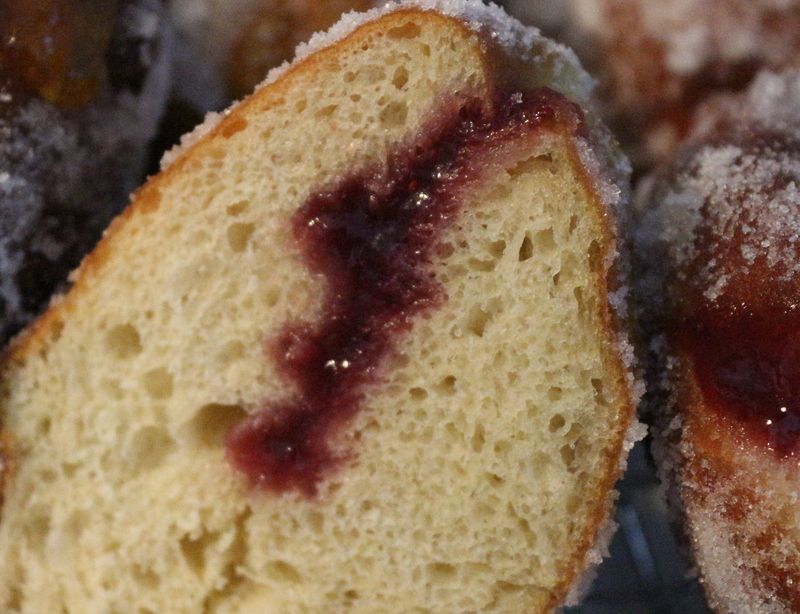 This time I wanted to make yeasted raised doughnuts, and as last week’s GBBO technical challenge was Jam Doughnuts….. time was ripe for another go! 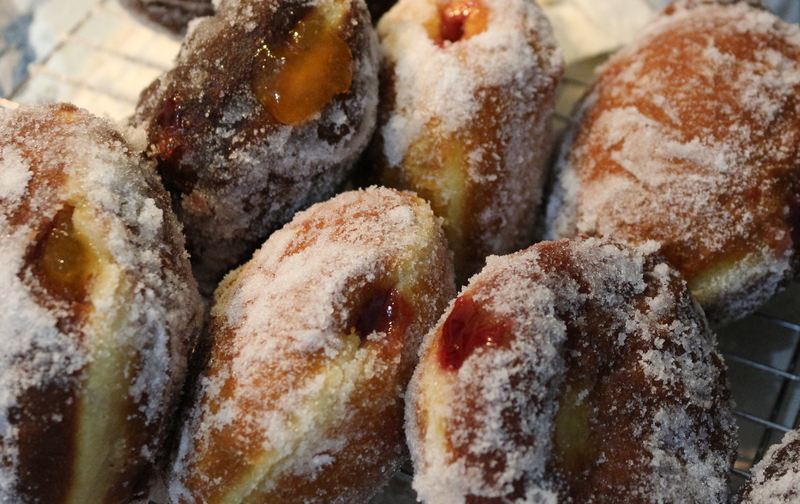 First off though, these guys take time… An hour at room temperature for the first rise, then knocked back and balls formed, then another hour of rising, then 10 minutes frying per doughnut…. So after work isn’t the time for these babies, you need an afternoon where you can play about for a bit. 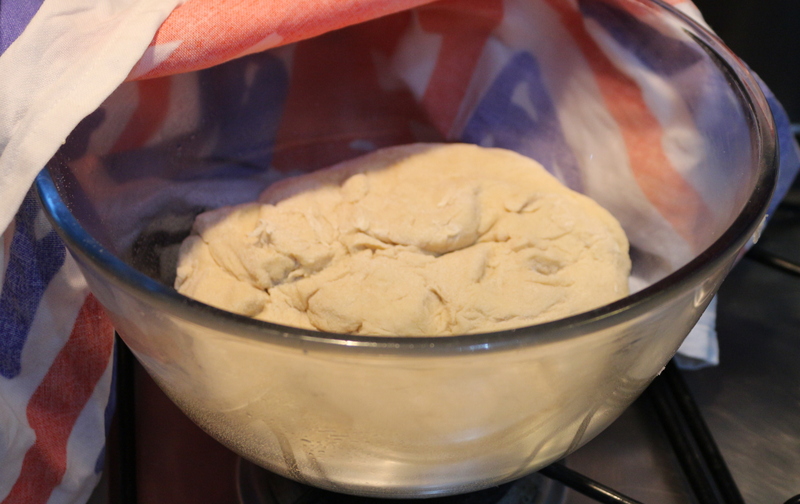 You can find the recipe either in the Great British Bake Off book, or here. 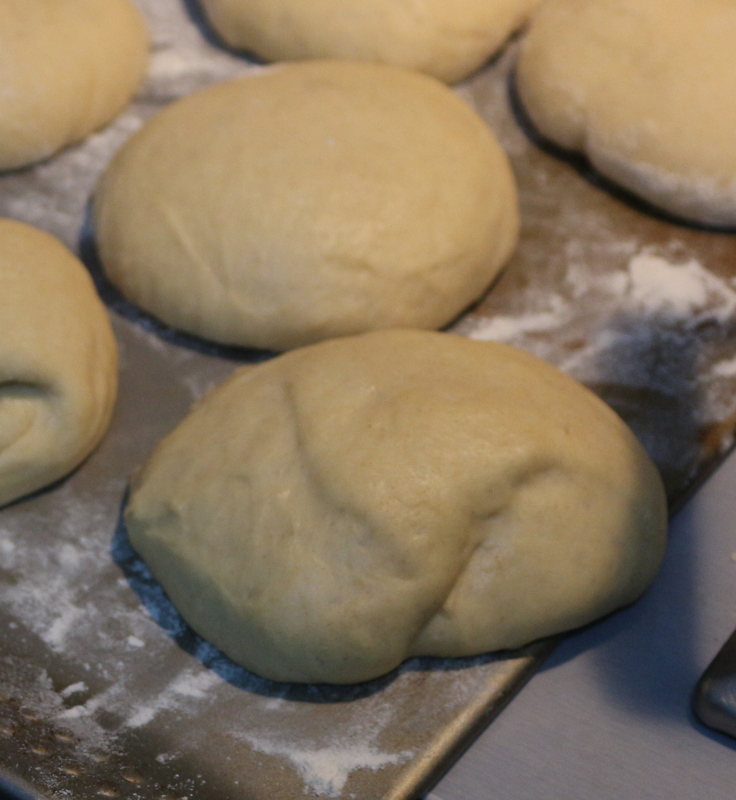 The dough is super sticky, a plastic scraper is your friend. Then for another 1 hour of rising…. ….Hmm some are more rounded than others! I used a deep pan filled to a third with sunflower oil, and heated it to 180C for frying. 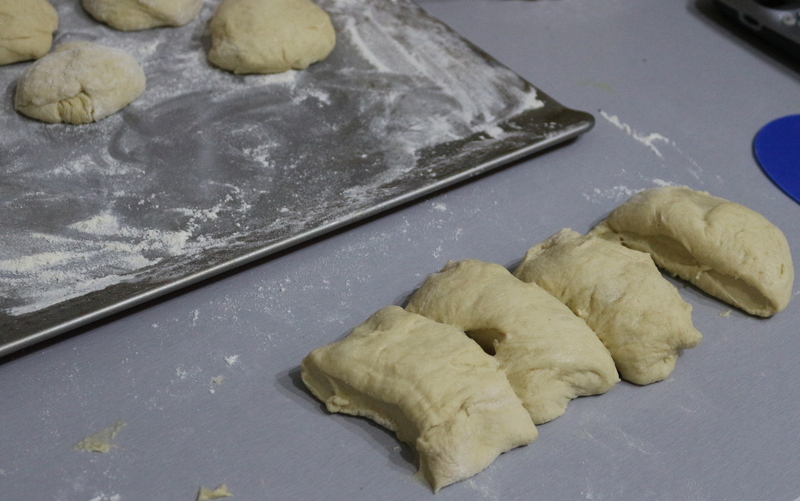 However, at 180C I found that the doughnuts cooked too rapidly on the outside, so I didn’t do the quoted 5 minutes each side on the first ones…. = raw innard! So I turned down the heat to about 160C, and that seemed to work better. 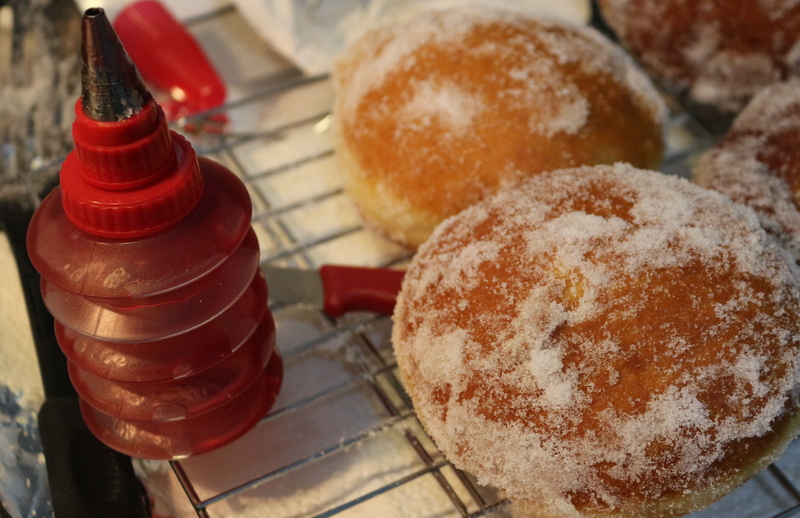 Once the frying is done, the balls are tossed in sugar, then it’s time to fill with jam! I poked a hole in the side with a small thin knife, then used my concertina icing bottle fitted with a small plain tip (from this set) to fill the insides with either raspberry or apricot jam. Then they were all done! Also I’m not sure that Mr Hollywood would be impressed with the amount of jam…. They were however, quite a hit, both with Mr M and the guys in the laboratory today. All are in fact now gone. I reckon next time some Lemon curd ones… maybes chocolate……. But they will be made again! 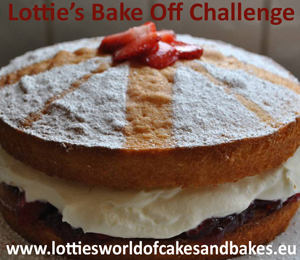 This is part of Lotties World of Cakes and Bakes Bake Off Blog Challenge! Update 14.10.2012: I made some more, filled them with homemade Lemon Cheese. De-lish. Wow, well done! These look great! Thanks! I’m hoping to have another go this week! They were, the second batch I made were even better, I filled them with homemade lemon curd. Yum!